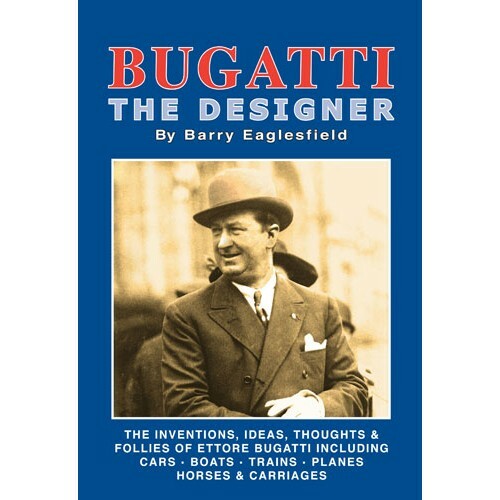 This book is about Ettore Bugatti’s extraordinary mind devoted to a multitude of inventions, designs, modifications, innovations, ideas, hobbies and follies. The object of this publication is an attempt to try and cover a very diverse and wide volume of work in the design field and includes Cars, Railway, Marine, Aircraft and Machine Tools. Contents include: The Bugatti Heritage 1676-2008; List of inventions, designs, ideas and follies in alphabetical order; Molsheim Electrics; Horses and Carriages; Machine Tool Patents; Aeronautics; Railways; Marine; Automotive. Appendices: Biography of Giovanni Segantini; Details of the Bugatti Aircraft Assoc. ; Details of the Bugatti Trust; Details of the Bugatti Owners Club. It will be seen that some of the information, photographs and technical drawings are from earlier times and are sometimes not of the reproductive quality we would have liked - many of them taken from newspapers and magazines initially printed on newsprint quality paper and even from carbon copies or photocopies. It is the information and photographs that we believe to be of interest which we feel is reason enough for inclusion in this book. A total of 360 fully illustrated pages. Softbound.